This title was first published in 2003. Social welfare is the focus of much discussion and there is a broad spectrum of political opinion that agrees on the need for urgent reform. The literature informing these policy debates draws on a diversity of theoretical traditions and discourses concerned with remaking community, yet there has been no in-depth, coherent political analysis of these various positions. This captivating volume provides such an analysis, enabling the diverse discourses informing current social policy debates to be identified and understood in broader perspective. The book frames the debates within the context of globalization and the accompanying shift in focus of social policy from issues of social justice to questions of social order. It identifies 'the community' as both the site of today's social problems and the main tool that governments have at their disposal to address these problems. This portrayal of 'the community' is both theorized and illustrated with empirical material drawn from the Australian experience of community action. Contents: Part I: Challenging Narratives of Community Decline: Introduction; The politics of community; Redefining poverty as 'Social Exclusion': political responses to globalization; Creating 'The Battler': the politics of community and the psychology of populist politics. Part II: Community as a Terrain of Political Contestation: Introduction; A portrait of the Australian community: tracing the changing face of community through the political discourse of the Australian Labor Party; Transforming the welfare state: the community politics of the new left; Community as a critic of government: expanding the role of welfare communities; Government as a critic of community: corporatizing welfare communities. Part III: The Search for a New Social Consensus: Introduction; Rediscovering 'The Social' through the concept of social capital; Beyond social capital; Bibliography; Index. 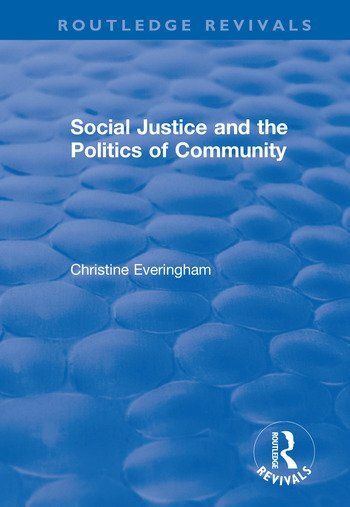 Christine Everingham is Conjoint Lecturer in the School of Social Science, University of Newcastle, Australia. She is the author of Motherhood and Modernity (1994). Prior to her academic career she spent ten years as a volunteer, working with health and welfare professionals on community development projects.